UN Youth Envoy @AhmadAlhendawi recently spoke to Model United Nations students in the General Assembly Hall. He posted this photo from his vantage point in the front of the hall on his Twitter account. At the 57th session on the Commission on the Status of Women, a participant from the Bahamas says No to violence against women and girls. Thanks to @SayNo_Unite for posting this photo and more on their Twitter account. Here is a photo of the Prince of Wales and Duchess of Cornwall wearing World Food Programme (WFP) vests during a recent visit to Syrian refugees in Jordan. Thanks to @WFP for posting this photo and more on their Twitter account. See how a partnership between the International Labour Organization (ILO) and the Republic of Korea allows Nok, a woman from Thailand, to migrate and take on a new job with all the apprehension and hope that accompany the migration process. Thanks to @ILONews for posting this video and more on their Twitter account. Truck vs. River! This convoy in South Sudan, part of the Logistics Cluster overseen by the World Food Programme (WFP), seems ready for the challenge. Thanks to @WFPlogistics for posting this photo and more on their Twitter account. Check out this bake sale that the UN Spouses Association in Bonn organized to support local women’s shelters. Thanks to United Nations Volunteers (UNV) for posting this photo and more on their Twitter account. Have a look at this interesting animated video made by the United Nations Office for the Coordination of Humanitarian Affairs (OCHA) explaining the 2013 Humanitarian Work Plan for Sudan and why help is urgently needed for millions of Sudanese people. Thanks to @UNOCHA_Sudan for posting this video and more on their Twitter account. Meet two polio volunteers, Nana and Boureima, who are determined to vaccinate children, even if it means crossing the sometimes dangerous Niger river. Have a look at other great photos in UNICEF Niger’s album on Facebook. Thanks to @UNICEFAfrica for posting this and more on their Twitter account. The Logistics Cluster in the Democratic Republic of Congo coordinates with the World Food Programme (WFP) to support humanitarian responses, even under tough conditions. Thanks to the Logistics Cluster for posting this and more on their Facebook page. Queanbeyan High School Students of Australia prepared this cake for Harmony Day and UN International Day for the Elimination of Racial Discrimination. Thanks to @UNICCanberra for posting this and more on their Twitter account. 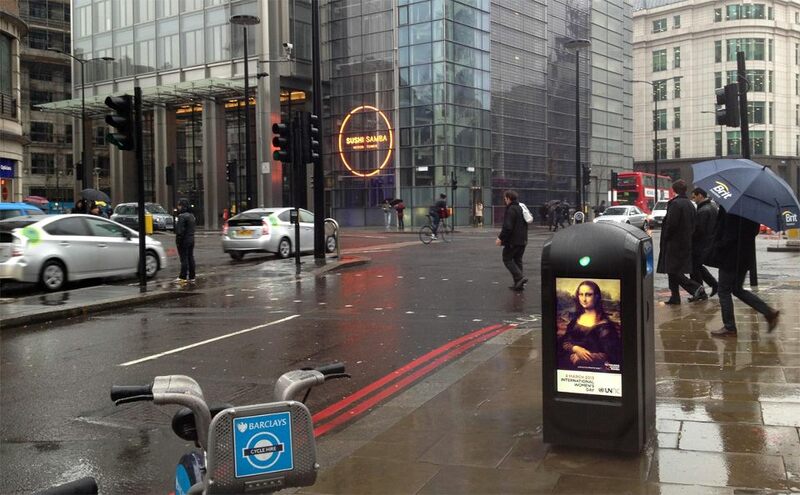 United Nations Regional Information Centre for Western Europe (UNRIC Brussels) partnered with the London based innovative recycling company Renew to mark this year’s International Women’s Day (8 March) by placing posters from UNRIC’s campaign to end violence against women on all of Renew’s 200 cutting edge recycling bins around the City of London. Thanks to Kaveh Memari of Renew for taking this photo.